Firefighters and police are getting their own series of Nexbelt’s belts in recognition for the sacrifices they make to serve and protect. The Thin Red Line series and Thin Blue Line series feature symbols used by both departments to respect those injured or killed in the line of duty. 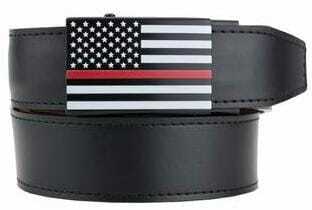 The Thin Red Line series features a color printed USA thin red line graphic mounted on a black buckle. The Thin Blue Line series offers the same color printed USA graphic but uses the familiar blue line to commemorate fallen officers. Both belts are built on Nexbelt’s “belt with no holes” platform, opting for a PreciseFit ratchet system that fits up to a 45-inch waist. Concealed carriers simply measure themselves and cut the black leather strap to accommodate their size. The flag buckles are 1 5/8-inches by 2 5/16-inches while the belt itself measures 1 7/16-inches. 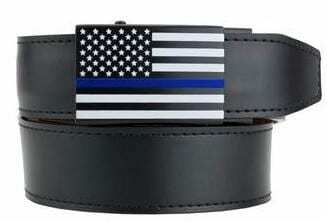 The Thin Red Line and Thin Blue Line series are available from Nexbelt, priced at $55.99.